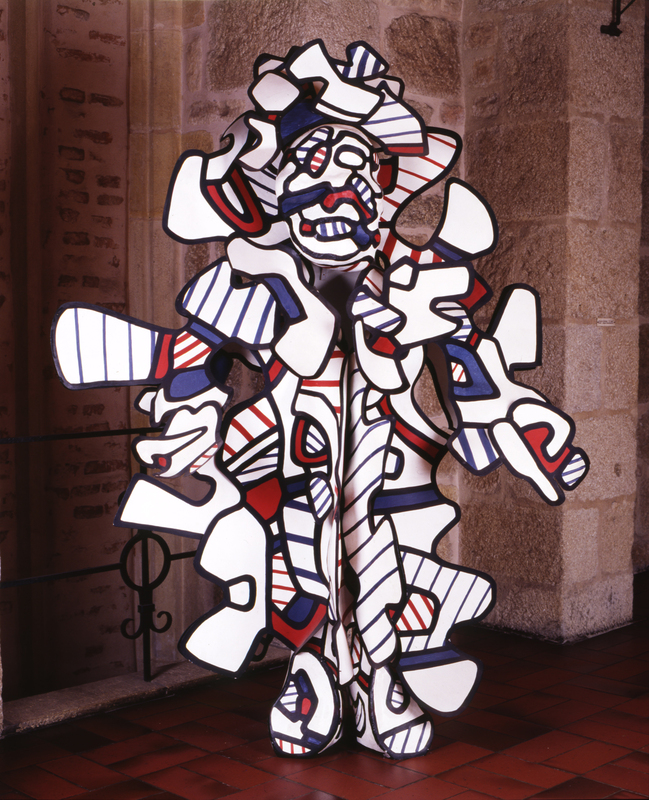 Conceived originally as one of the personages to be included in the artist’s animated-painting extravaganza Coucou Bazar, this sculpture was intentionally set aside but nevertheless remained, in Dubuffet’s mind, intimately linked with his circus-like spectacle. Certainly it can be seen as capturing the essence of this celebrated performance piece, first presented in 1973 at the Guggenheim Museum in New York and a few months later at the Grand Palais in Paris. A patchwork of scenes performed one after the other without any narrative structure, accompanied by an original musical score designed, in Dubuffet’s own words, to be “dissonant and cacophonous”, this event featured a set of sculptures or paintings, which Dubuffet called the Practicables, that were moved, or animated, on stage by actors/dancers dressed in costumes also created by the artist. A modular sheet-metal construction painted with polyurethane, Don Coucoubazar is a three-dimensional enlargement of the figures drawn by Dubuffet, representative of the cellular structures favoured by the artist during this period. Purchased from Dubuffet in 1978, this was the first work by the artist to join the museum’s modern art collections. In 2008, the bequest by Jean-Paul Person of more than thirty paintings by Dubuffet raised the profile of this artist within the Musée Unterlinden, now recognised as well represented within its collections.